In large sauce pot, cook ground chuck over medium-high heat 8 minutes or until browned, breaking up ground chuck with side of spoon; transfer to paper towel-lined plate. In same sauce pot, cook bacon over medium heat 5 minutes or until crisp, stirring occasionally; with slotted spoon, transfer to separate paper towel-lined plate. To drippings in sauce pot, add onion; cook 4 minutes or until softened, stirring occasionally. Add garlic; cook 30 seconds, stirring occasionally. Add flour; cook 1 minute, whisking constantly. Add broth, cream and dry mustard; cook 2 minutes or until slightly thickened, whisking frequently. Add 1 cup Cheddar cheese, American singles and ground chuck; reduce heat to medium-low and cook 10 minutes or until heated through and cheese melts. Makes about 6 cups. 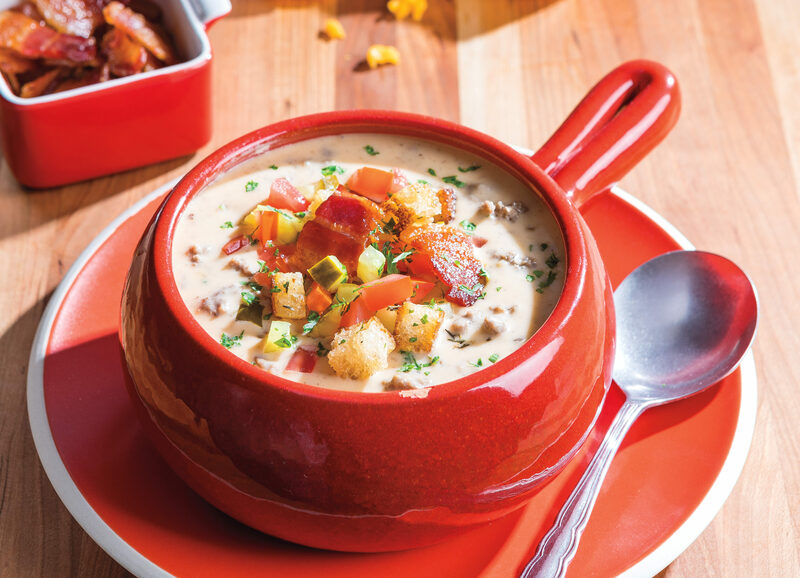 Serve topped with bacon, tomato, croutons, pickles, remaining ¼ cup Cheddar cheese and hot sauce.